NAZARETH, Israel (CNS) — Pilgrims wishing to follow Christ’s footsteps from his childhood home in Nazareth through Galilee have a visually stimulating and inspiring path to follow. With vistas spanning from horizon to horizon and the chance to meet the varied people who call Israel home, the Gospel Trail takes pilgrims and recreational hikers alike on a 37-mile journey from the Mount of Precipice on the southern outskirts of Nazareth to the ancient town of Capernaum. The easily accessible and well-marked trail offers the chance to explore the journey that Jesus followed as he started his three-year public ministry. It traverses ancient communities, ruins, natural areas, springs, farms and olive groves, offering views not unlike what Jesus might have seen 2,000 years ago. 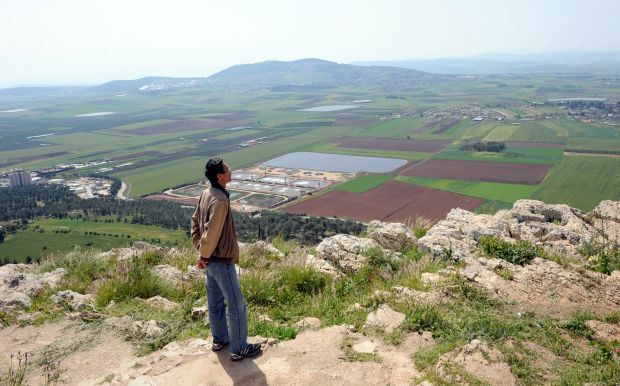 “We believe this heritage way can give a good answer to many tourists … looking for a meaningful visit here, not only in churches and archaeology sites, but also the landscape,” said Amir Moran, Gospel Trail project director for the Israel Ministry of Tourism. Moran said no one is 100 percent sure of the route Jesus took through Galilee, but that topographical and biblical research point to the trail as a likely choice. 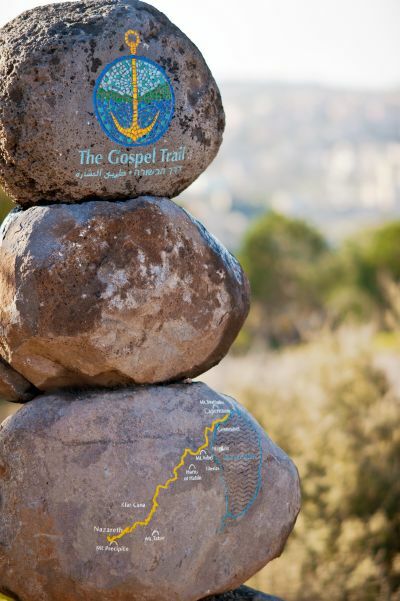 Large trail markers made of stacked stones emblazoned with the mosaic-like Gospel Trail logo guide hikers along the wide, manicured path. The trail begins atop the Mount of Precipice, where tradition holds that an angry mob tried to throw Christ from a cliff after people became upset with his sermon at the synagogue. Several years in development, the trail follows ancient paths used by farmers, shepherds, villagers, merchants and armies for centuries. The trail also is known for its natural beauty, taking visitors past lush natural areas where flora and fauna abound. Moran said the trail was laid out so that visitors could be introduced to the varied cultures that make up Israel. “If this is Arab villages or Jewish villages, whatever along the way, it gives the tourist a unique experience for contact with them, which is not done when they come with a bus and visit a church, only a church or an archaeological site,” he said. A suggested itinerary breaks the trail into four stages, but hikers can trek as far as they want on any given day. Overnight accommodations ranging from first-class hotels to quaint bed-and-breakfast inns are reached easily from the trail, assuring hikers of comfortable places to rest along their journey. Nearby restaurants offer a variety of cuisines ranging from contemporary to traditional Middle Eastern fare. Secondary trails give pilgrims the chance to visit Mount Tabor, believed to be the site of the Transfiguration; Cana, site of Jesus’ first miracle; the Mount of Beatitudes; and several other historic and important sites. Those venturing up Mount Tabor will be greeted by the Church of the Transfiguration, built by the Franciscans between 1919 and 1924. The church can be seen for miles from the fertile biblical Valley of Jezreel to the southwest as well as from the hills that gradually unfold toward the southern end of the Sea of Galilee. In Cana, the Franciscan Wedding Church can be reached after a short walk through a residential neighborhood just off the town’s main street. The church was consecrated in 1883 to commemorate the wedding feast where Jesus turned water into wine. A massive painting of Christ instructing the servants at the wedding to fill six cisterns with water graces the wall above the main altar. The Gospel Trail also is open to bikers along most of its route. Moran said the trail always was envisioned as being available to as many people as possible, no matter how they make their way along it. Several sections of the Gospel Trail are accessible to people in wheelchairs or who have limited mobility to allow them to experience the same vistas that Christ might have enjoyed. c. are all parts of the trail open in February.